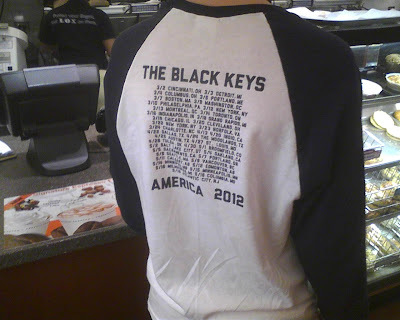 this morning, the kid in front of me at einstein bros bagels was wearing this shirt. there's a good chance this kid got to see the black keys at the united center last night. i'm using the word kid because he couldn't have been older than fourteen. as i opened the door for him, i said, "i like your shirt" and pointed to it. he had his headphones in and probably assumed i was saying, "after you." he bought a bagel and an apple juice box. when we were standing in line he turned, looked at me, and half-smiled. i smiled and for a second i thought, are we having a mrs. robinson moment here, young man? it was nice. and it made me smile.